With so many important people buried in one place, almost every day can be a special one. 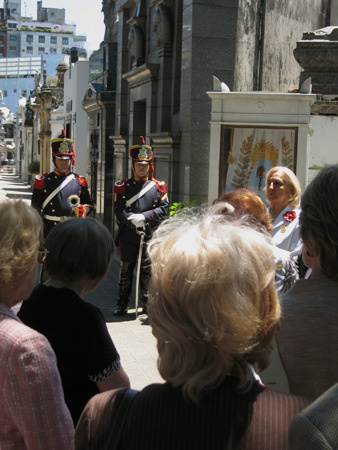 There’s no way to keep track of what might be happening in Recoleta Cemetery… the city or national government needs to start an official blog to announce burials & special commemorative events that take place. Like today. I was wandering around taking photos for this blog when I heard a few trumpets play a funeral march. I went—along with hordes of tourists—in the direction of the music to see what was going on. 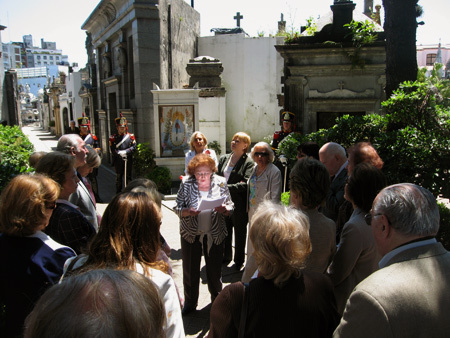 The whole process took 15 minutes but the women had gathered to pay tribute to the wife of Argentina’s founding father on her birthday. She was born on November 20, 1797. I hope someone remembers my birthday 200 years from now!